Thong Tanote Beach, a secluded beach on the south coast of Koh Samui, offering breathtaking scenery of the Gulf of Thailand. You have an amazing view of Koh Tan & Mutsum Islands. We encourage our guests to take advantage of the amazing and immediate snorkeling and diving exploration available on these islands. The south coast is very relaxing and there is no shopping or nightlife nearby though it is only a 20 min. drive to Lamai or 30min to Chaweng. Although not really a spot for swimming, Thong Krut Bay still has the image of a small fishing village, with a nice view of islands to the south. On the beach, wooden restaurants built on stilts are nice places to have a drink. 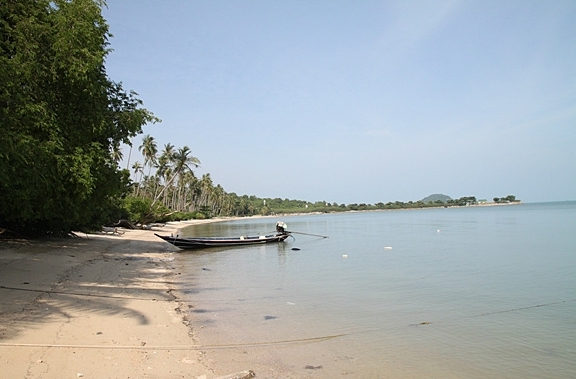 At the end of the beach, the road goes back to the mainland for a short while on its way to Bang Kao Beach. But before arriving at Bang Kao, take the small road to Laem Sor on your right-hand side and drive a kilometer to discover a surprising, yellow-tiled pagoda built right on the seaside. It’s a great place to take some pictures! Along the road are many typical, old Thai homes and some very small shops selling basic necessities for the local population. These shops are often run by smiling, friendly old people, so why not stop in and say hello! Some places in Thong Tanote seem not have changed in decades and are interesting to have a look at.